It’s no secret that all of us at Gallagher Wellness Centre LOVE our Young Living Essential Oils! Here's why! We all know that fruits, vegetables and herbs are full of nutrients. The vitamins, minerals, and other compounds found in them nourish our bodies far better than any man made concoction. In fact, the nutrients in these plants have been linked to the physical, emotional and spiritual well-being of humans pretty much since the beginning of time. They have been used medicinally throughout history to kill and combat many maladies, balance moods and create desired atmospheres. Essential oils are volatile liquids and aromatic compounds that are distilled or pressed from plants. They are highly concentrated and far more potent than their fresh or dried plant counterparts. They deliver powerful therapeutic properties and are very versatile. Like the blood in the body, the essential oil of a plant is used to seal the cut, protect the wound, provide nutrients and oxygen for cell regeneration and guard against harmful microorganisms. 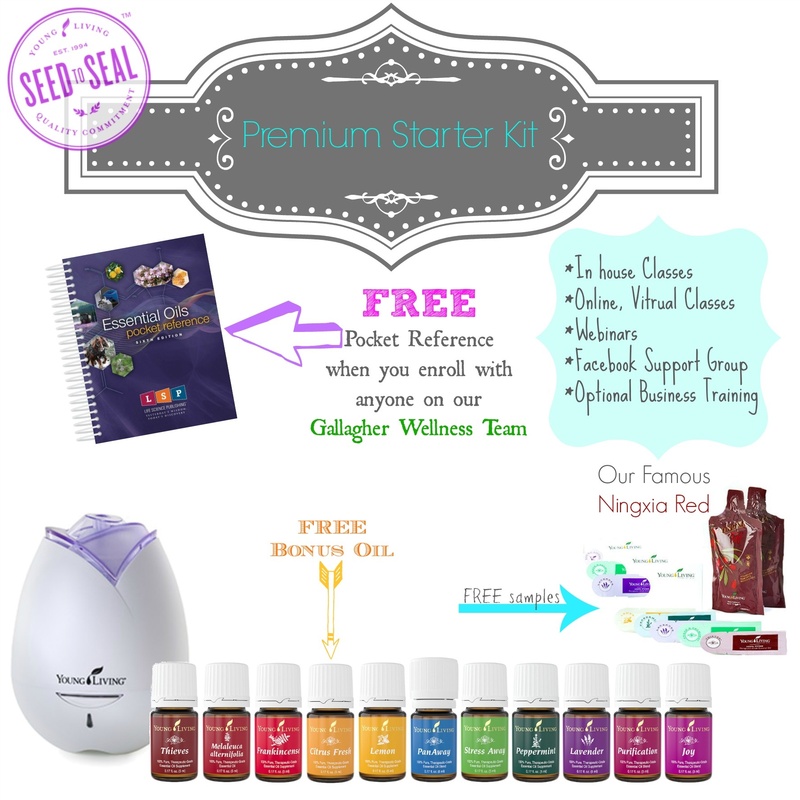 At Gallagher Wellness Centre you will notice that we only recommend the use of Young Living Essential Oils. This is because we believe they are the purest in the industry because of their Seed to Seal® process and the guarantee that their oils are completely unadulterated. Also, we have seen amazing results in each of our lives because of the use of these oils. In our opinion, they have helped us achieve cleaner, healthier and happier homes. The Raindrop Technique® was developed by D. Gary Young and is one of the safest, most noninvasive treatments available for spinal health. It combines the art of aromatherapy with the techniques of Vita Flex and massage in the application of essential oils to various areas of the body. 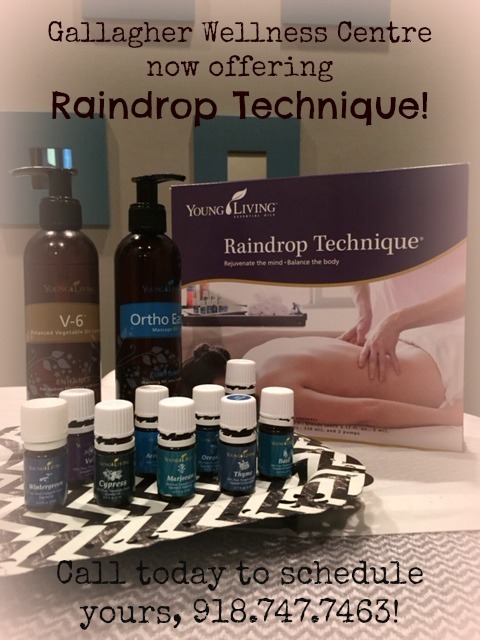 When performed correctly, Raindrop Technique can result in physical, emotional & mental rejuvenation. Only pure, Young Living Therapeutic Grade™ essential oils are used. The following specially selected essential oils and blends promote healing from within by encouraging the balance of energy and the release of toxins. They also soothe muscles, reduce pain and facilitate open energy flow throughout the body. Ortho Ease® Aromatherapy Massage Oil and V-6™ Enhanced Vegetable Oil Complex are also used. Bring balance and harmony to your body today by calling to schedule your appointment - we promise you won’t regret it! **The above description was taken from the Essential Oils Pocket Reference and youngliving.com.